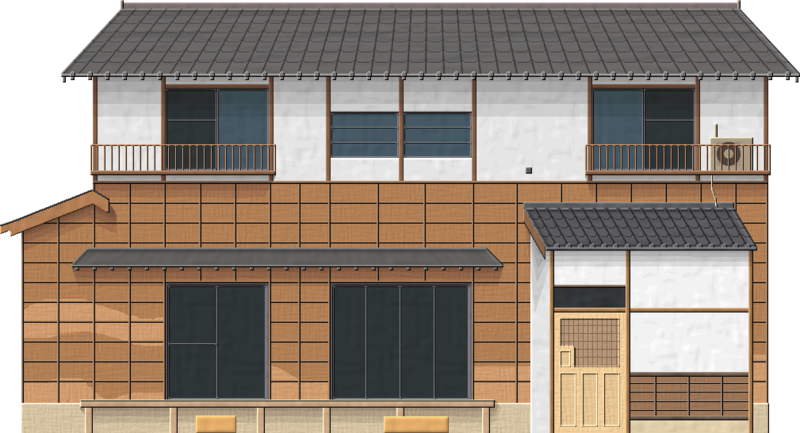 Hi, im trying to do japanese houses, someone have some tips for me? Your perspective is wrong. At the same time you see whole roof and wall like they are in the same plane. Red color that you choose for roof is very unappealing. You should learn some thing about perspective, find some good references (type of the house, architectural period etc.) and try again. Edit: But what if i have this perspective? its wrong? (2) Edit: OH :O its like this? After perspective, shading is key. Presently there is almost none, yet it will be essential to define volumes, in ways that perspective can't. You have to decide on a light source and apply it everywhere. It could be strictly top-down, or 45° from a side (these are easy, but of course it could be anything). Think of all surfaces (for instance, windows and door recesses), determine if perspective allow them to be seen and if they would be in light or shadow. Give shadows enough contrast that they are obvious. At the moment, there is a slightly darker yellowish that is undecided: looks like shadow below the roof (but way too short), makes no shading sense around windows and door. Much better , it's good that you listened and learned. Now, you have to determine light source and create shading accordingly. So, the perspective is okay? Yes, now it looks like something that exists in 3d world, which is good. As I said it will look much better, when you improve shading.